Every year many dogs are bitten by rattlesnakes and die or suffer through the pain, trauma and illness associated with a rattlesnake bite not to mention the financial cost ($1500-$10,000 yes we have heard of people spending that much to save their dog) while the pre bite therapy offered by veterinarians gives hope of your pet surviving a rattlesnake bite it does not make them immune and they will still need the anti venom treatment, also there is no anti venom treatment for the Mojave green rattlesnake that lives in our deserts, if your dog is bit by a Mojave green it will most likely die. If you live in the southwest whether it is an urban or rural environment you live near rattlesnakes, Southern California’s beach areas, foothills, mountains, canyon country and desert’s are rattlesnake country. Urban development does not chase them away. 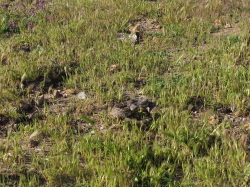 While none of us want these creatures living in our yards it is inevitable we will come in contact with them because they are attracted to areas that hold small rodents and vermin (lush cover and gardens are places rodents like to be) and rattlesnakes do serve a purpose in abating these intruders. Because we couldn’t and shouldn’t try to eliminate them we must learn to coexist with them which means being cautious about how we conduct our daily lives. It only makes sense that our pets should be trained to avoid them. 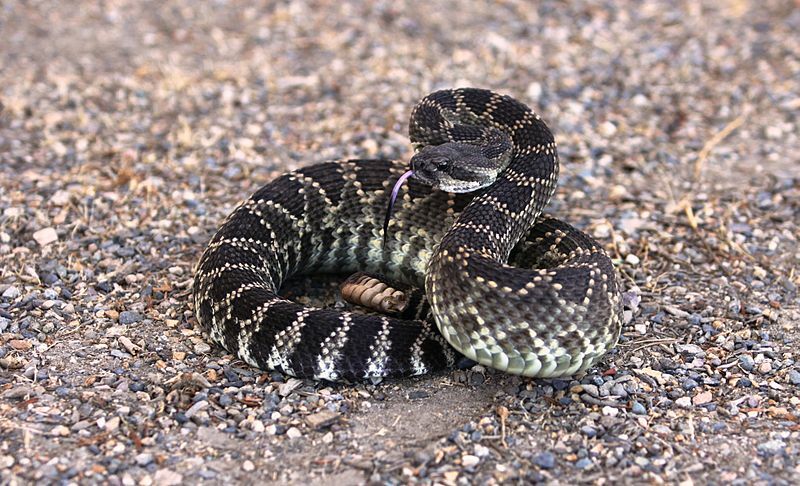 How many times have you let your dog out into the back yard in the morning or evening to do their duty without the thought of a rattlesnake being present? Because we are trainers we have heard too many sad stories about how their pet was bitten in their own back yard. If you hike or spend time in the back country or local canyons and trails with your dog the same dangers exist. 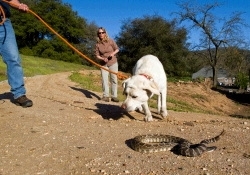 We at High On Kennels recommend that all dogs be trained to avoid rattlesnakes. Training is simple, quick and effective. High On Kennels has been providing rattlesnake avoidance training for over thirteen years now, our rattlesnake training has been featured in the San Diego Union Tribune, News 8 and Channel 10 news. 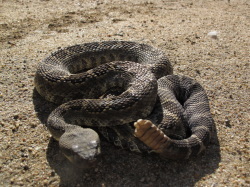 If you live in the southwest whether it is an urban or rural environment you live near rattlesnakes, Southern California’s beach areas, foothills, mountains, canyon country and desert’s are rattlesnake country. Urban development does not chase them away. While none of us want these creatures living in our yards it is inevitable we will come in contact with them because they are attracted to areas that hold small rodents and vermin (lush cover and gardens are places rodents like to be) and rattlesnakes do serve a purpose in abating these intruders. Because we couldn’t and shouldn’t try to eliminate them we must learn to coexist with them which means being cautious about how we conduct our daily lives. It only makes sense that our pets should be trained to avoid them. How many times have you let your dog out into the back yard in the morning or evening to do their duty without the thought of a rattlesnake being present? Because we are trainers we have heard too many sad stories about how their pet was bitten in their own back yard. If you hike or spend time in the back country or local canyons and trails with your dog the same dangers exist. We at High On Kennels recommend that all dogs be trained to avoid rattlesnakes. Training is simple, quick and effective. High On Kennels has been providing rattlesnake avoidance training for over thirteen years now, our rattlesnake training has been featured in the San Diego Union Tribune, News 8 and Channel 10 news. 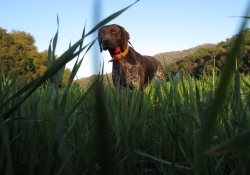 We have found the best way to teach a dog to avoid rattlesnakes is to use live rattlesnake specimens that have been neutralized so that they cannot bite. 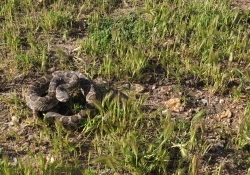 The snakes are placed out in a field setting and the dogs are fitted with an electronic training collar, the dog is led through the field and allowed to encounter the rattlesnakes at which point the dog is stimulated using the electronic collar, The process is repeated several times to insure that the dog understands the sight, sound and smell of a rattlesnake (rattlesnakes have a distinctive odor that a dog can discern from other snakes). We have found that some dogs seem to forget over a period of time and recommend annual training for all dogs. We recommend getting your dog trained early in the year as rattlesnakes become active as the weather warms up in the spring, we conduct training during the spring, summer and fall months at our facility and have also teamed up with several dog breed and training clubs, as well as conservation organizations in California and are conducting these clinics throughout the state check out our calendar for the clinic nearest you. The training is relatively quick and you can expect to spend less than an hour at the clinic, if your dog doesn’t get it right away we will work with your pet until we are satisfied that it understands and is avoiding the snakes. If you are interested in having you pet trained visit our FAQ’S page for additional info and our registration page to sign up. You can also call and make an appointment. If you want to attend one of our partnered events, take a look at our calendar for contact info and how to sign up with the organization we are working with. Personal training is also available at your home, call us for details. Do you belong to a club or organization that is looking for fund raising opportunities? We would like to partner with your organization and put on an event. It’s a great way to raise funds for your organization while offering a great service to your community. It’s simple and doesn’t require much in the way of resources, all you need is a few people to help on the day of the event (or we can staff the entire event) and a small area to do the training. Call or e-mail us and we’ll discuss the details. A final word about rattlesnake avoidance training and trainers, in the past few years we have seen an increase in the number of people calling themselves rattlesnake avoidance trainers. There are a few of things you should consider when deciding to have someone rattlesnake train your dog. Are they professional dog trainers and for how long? How long have they been teaching rattlesnake avoidance?Have they had much experience with electronic training collars? Electronic collars are great tools but can cause needless stress when used improperly. Do they use live rattlesnakes? Nothing behaves and smells like a rattlesnake except the real thing. Are they insured? We are fully licensed and insured.